Margaret E. Jacobs, 93, of Solomon, departed this life April 12, 2019, at her home. Margaret was born Oct. 26, 1925, in Tipton to Alphonse and Elizabeth (Krier) Fischer. She was united in marriage on Sept. 1, 1952, to Edward J. Jacobs. The Jacobs family moved to Solomon in 1959, where they raised their six children. She was a member of Immaculate Conception Catholic Church and St. Ann’s Altar Society. She was employed by Abilene Pizza Hut from 1973 to 1994. 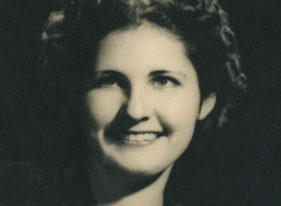 She also served as President of the Abilene Red Cross in the 1970s. Preceded in death by her husband, Edward, on July 5, 2008; sisters, Matilda, Helen and Christine; and brothers, Gene and Wayne. Survived by one sister, Mary Ann Schreck, of Tipton, Mo. ; her six children, Bond Jacobs (Gay), of Delta, Colo., John Jacobs (Pat), of Salina, Joan Huston (Mark), of Olathe, Jane Jacobs-Lowe (Richard), of New York, N.Y., James Jacobs (Mary), of Lenexa, and Jean Odle (Ted), of McPherson; grandchildren, Tinker Duclo (Jay), Jeremiah Jacobs (Silvia), Michael Jacobs, Christine Cressler (Preston), Jackie Jacobs, Emily Huston, Jessica Knox (Devin), Rachel Jacobs, Weston Jacobs, Maggie Jacobs, John Paul Jacobs and Grace Jacobs; eight great-grandchildren; and many nieces and nephews. Margaret will always be remembered for her kind heart and helping hand. She was a loving, dedicated Christian woman who was faithful to her family and her church. Anyone who knew her knows she lived her life with purpose. Visitation will be at 6 p.m. Tuesday, April 16, followed by rosary services at 7 p.m., at Immaculate Conception Church, Solomon. Mass of Christian Burial will be 10:30 a.m. Wednesday, April 17, at Immaculate Conception Church, Solomon, followed by burial at Mount Calvary Cemetery, Solomon. The family suggests memorials to Benedictine College and Sisters of St. Joseph, in care of Ryan Mortuary, 137 N. Eighth, Salina, KS 67401.